As a “Faithkeeper,” Oren Lyons is the person responsible for passing on and interpreting his people’s traditions, legends, and prophecies. He is a Chief of the Turtle Clan of the Onondaga, one of the Six Nations in the Iroquois Confederation. Moyers talks with him in his cabin on Onondaga land in upstate New York. Lyons’ words are startling both for their historical perspective and their practical value. Giving a history lesson which will be news to many Americans, he explains how the Founding Fathers of the United States drew upon the American system of government when making their plans for the nation. As early as 1744, Benjamin Franklin was present at a meeting where the Six Nation chiefs advised the governors of Delaware, New York, and Pennsylvania to form an indivisible union. People around the world today are looking to America for democracy but “America got the ideas of democracy and freedom and peace from the Indians,” Lyons explains. Except for one important ingredient, Lyons contends. “They refused to use spirituality as a part of the nation. Our advice to you was a spiritual center,” whereas the United States system separates church and state. “We said, ‘Problem coming.’ “According to Lyons, the problems which can be traced to a lack of a spiritual law, have kept coming through the centuries. In 1799 the legendary figure Ganyahdiyok or “Handsome Lake” was given a vision of the future and saw environmental disasters including air and water pollution. 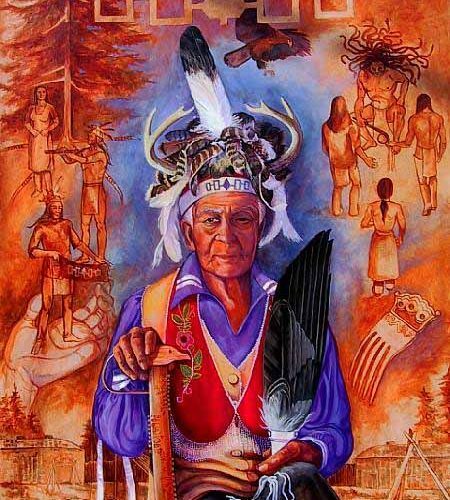 Repeatedly, he emphasizes the importance of community to the Onondaga, from their games to their ceremonies.On the practical level, he talks about living day by day, the importance of not taking ourselves too seriously, and accountability to the next generation.”When you sit in council for the welfare of the people,” he says, “you council for the welfare of the seventh generation to come so that when their time comes here they may enjoy the same thing that you’re enjoying now.